The Battle of Mactan was a historical event that took place six centuries ago, in April 27, 1521. It is the first known and recorded resistance of the Filipinos against foreign forces who aimed to invade and conquer the Philippines. **At that time, the local people were not yet called “Filipino” as the nation “Philippines” was not yet born. While on his way to the Moluccas Islands on a mission for Spain, Ferdinand Magellan, a Portuguese Conquistador, sighted the Philippine archipelago and landed in Homonhon. While on the island, he befriended the chieftain of Limasawa, Rajah Kulambo who guided the Spaniards to Cebu. Magellan became friend with Rajah Humabon, the ruler of Cebu. The rajah, his wife and their followers were converted to Christianity and were baptized into the Catholic faith. After their baptism, Magellan gave an image of the Santo Niño to Queen Juana, Humabon’s wife. Rajah Humabon became an ally of Magellan. He issued an order to the other chiefs in Cebu to provide food and other supplies to Magellan’s ships and that they too must embrace Christianity. The local chieftains followed Humabon’s order except Datu Lapu-Lapu, one of the chiefs in Mactan Island, who refused to obey the directive of the rajah of Cebu. Rajah Humabon and Datu Zula, another chieftain of Mactan Island suggested to Magellan to force Lapu-Lapu to comply with Humabon’s order and recognize the King of Spain as their sovereign. To strengthen his friendship with Humabon, Magellan agreed to sail to Mactan to subdue the defiant Lapu-Lapu who rejected Christianity and who refused to pay tribute to the Spanish crown. Antonio Pigafetta, the voyage chronicler of Magellan, recorded that on April 27, 1521, Ferdinand Magellan sailed to Mactan and deployed 48 men armed with swords, axes, cross-bows and guns. However, Magellan’s ship could not directly land on Mactan, they had to anchor far from the shore due to the rocky outcroppings and corals near the beach. This rendered his ships armory almost useless as he was not able to use his firepower against Lapu-Lapu and the native warriors. The Spaniards climbed down their ship and waded through shallow water to reached shore. This is a bit challenging for Magellan and his men for they were wearing suits of armor that weighed them down, while the natives on the other hand which is said to be around 1,500 strong men waited for the Spanish to come closer, ready for the battle. With the Spaniards at striking distance, warriors armed with bows rained arrows against them. 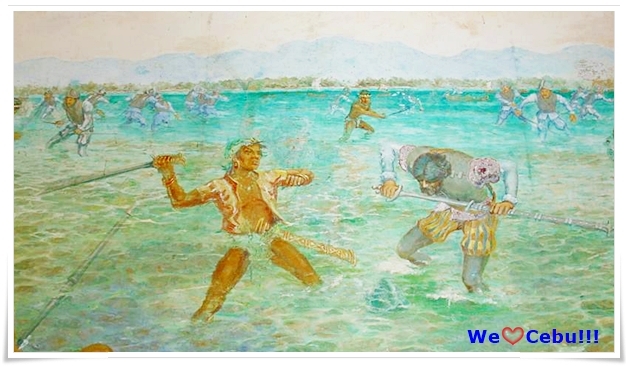 Then the rest of Lapu – Lapu’s men charged brandishing their bolos, spears and kampilans. To terrify their adversaries, Magellan ordered his men to burn the houses. However, this made the natives only more furious and they swarmed upon the foreigners. Magellan’s leg was shot with a poisoned arrow while his arm was wounded by a spear. When the native warriors recognized Magellan, many come upon him. Magellan’s men retreated to their boats when they saw that their leader was killed, leaving Magellan’s body behind. According to Pigafetta’s chronicle, Rajah Humabon sent a message to Lapu-Lapu to negotiate the return of the bodies of the captain and his men in exchange of all merchandise Lapu-Lapu wanted. However, Lapu-Lapu’s swift response was that they will not return Magellan’s body in exchange of all material riches because the captain’s body is far more important as the symbol of their triumph against the foreign invaders. With the death of Magellan and defeat of the Spaniards in this clash, the Battle of Mactan becomes a historic event that marks the Filipinos first struggle against foreign invasion. Today, books on Philippine history recognize Lapu-Lapu as the first Filipino Hero. He probably did not kill Magellan himself, but he is a symbolism for that first fight to resist invaders and foreign subjugation. 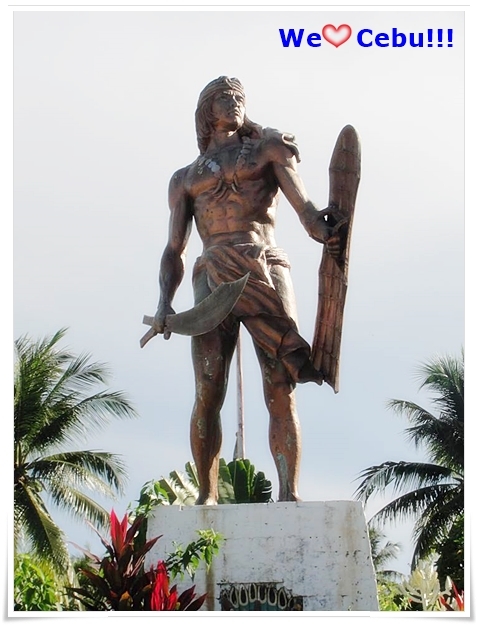 There is an annual commemoration for the Battle of Mactan in Punta Engano in Lapu -Lapu City, this is also the location where you can find the Liberty Shrine and one of Cebu’s tourism landmark – the Statue of Datu Lapu-Lapu. Come and visit LLC every April 27 during the Kadaugawan sa Mactan Festival to celebrate with the people and to witness the re-enactment of this historical battle. Like us on We LOVE Cebu official Facebook Page for more interesting facts and events here in the Queen City of the South!! !